Welcome to the centerpiece of Centennial Park in downtown Nashville, the Parthenon. 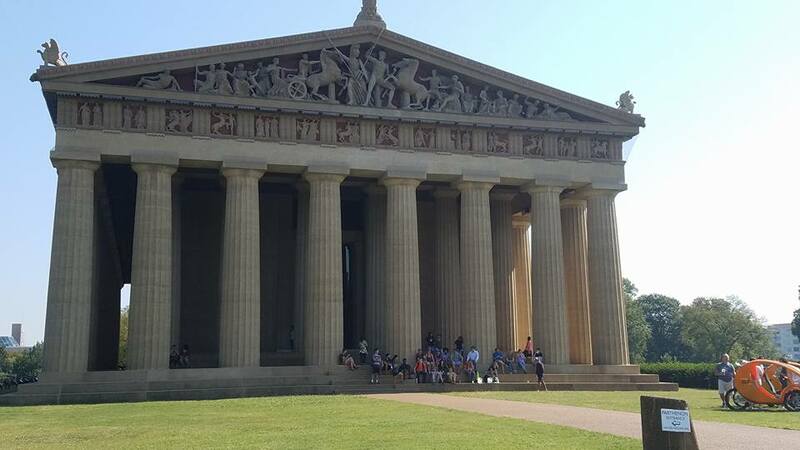 Located in Nashville’s premier urban park, this art museum/architectural wonder is the world’s only full-size replica of the Parthenon and houses the tallest indoor sculpture in the nation, of the Greek goddess Athena. The re-creation of the 42 foot Athena is an authentic Ancient Greece full-scale replica that was originally created in 1897 as a featured piece of the Centennial Exposition. The monument is a pinnacle of classic architecture and is an impressive twin of that in Greece. The building itself features the classic columns all around, sticking to true Grecian architecture with no exact measurements or similar distances between any of them. One of the most impressive parts of this statue is the plaster replicas of the Parthenon Marbles which were directly cast from the originals now housed in the British Museum in London. These original marbles date back to 438 BC! Inside, Nashville’s Art Museum holds a permanent collection of 63 paintings by 19th and 20th-century artists, as well as 2 temporary galleries featuring traveling exhibits of interest. A closer look at Athena shows the true detail, down to her cuirassed and helmeted figure featuring a shield on her left arm and 6 foot high Nike statue in her right palm. This statue features 8 pounds of gold embossment! Your group can also see photos, memorabilia, and souvenirs from the original Centennial Exposition inside. Make sure you stop by the gift shop and visitors center and feel the full experience of the "Athens of the South."